An impression of the proposed 30 million Lake Torrent motorsport complex. The 180-acre Lake Torrent site in County Tyrone proposed for a £30 million motorsport circuit has been put up for sale. It had been hoped the venue near Coalisland would host a round of the World Superbike Championship, but the project has been in doubt ever since receivers were appointed in October last year. Four-time world champion Jonathan Rea had welcomed plans for a World Superbike round at the Lake Torrent site. Led by Manna Developments Ltd, construction began on the 2.2-mile complex on the former clay pits site in 2017 but was later halted due to planning issues. In January last year, a three-year deal was announced with World Superbike promoters Dorna to bring the series to the Lake Torrent track as early as this year. However, while the ambitious venture has ultimately fallen flat, top British Superbike rider Glenn Irwin does not believe losing the facility will affect the progress of young riders in Northern Ireland. Speaking to the News Letter when it was revealed that Manna Developments Ltd had gone into receivership last October, Carrick man Irwin said: “I don’t think this will have an effect on the opportunities for young riders coming up in the future. If you look at our history here, the likes of Joey Dunlop and Brian Reid – who became world champions – grew up racing on circuits like Aghadowey and Kirkistown. 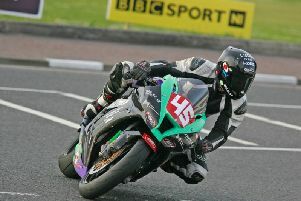 Top British Superbike competitor Glenn Irwin. “Jonathan Rea’s talent was matched by a fantastic opportunity he got through Red Bull, while I learned my trade here at home; the tracks that I grew up on didn’t do me any harm. I was also fortunate to have good sponsors coming in to back me at a good time in my career. “People may look at this news as a big blow to racing here or the future of Irish motorcycling, but in my opinion it won’t have any impact on the quality of riders that we are producing,” he added. “Don’t get me wrong, of course it would be a dream to have a round of the World Superbike Championship here on a top class circuit, especially as we have a four-time world champion in Jonathan Rea.